Wherever you are on life's journey you are welcome here. We are an open and welcoming Church for people from all walks of life who would like to explore faith a little more. If you are new to church, or if you are looking for a church, or if you simply have questions about life we think you might find a home with us. Why? Well, we are people who have questions about faith and life and we have found that thinking about things together is better than doing it alone. Seeking god together helps us to notice things we might otherwise miss, it helps s to support one another in good times, bad times and times when we struggle. We know that God is calling to us and wants us to know God more than we do now. We come together on Sunday seeking to connect with God and each other. Whether you are able to join us on Sunday or at one of our weekday activities you will be very welcome. Our building is accessible to most people. The car park off Oldfield Rd allows level access to the building and the public areas of the building are step free. Toilets suitable for people with disabilities and with baby changing are available. the worship space has a hearing loop fitted. We meet for worship every Sunday at 10:45 with communion mostly on the 2nd Sunday in the month. 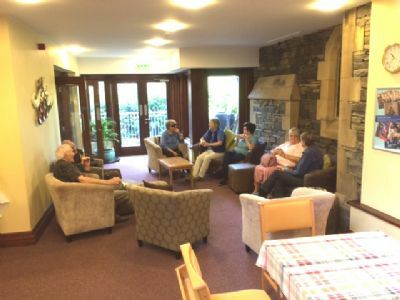 Croissants and Chat is at Windermere Methodist Church at 9am on the fourth Sunday morning in the month. We welcome anyone of every background and as a Uniting Church we are a part of the United Reformed Church and the Methodist Church. Carver Church is on Lake Rd Windermere LA23 2DB and there is parking on the street and in our two car parks.